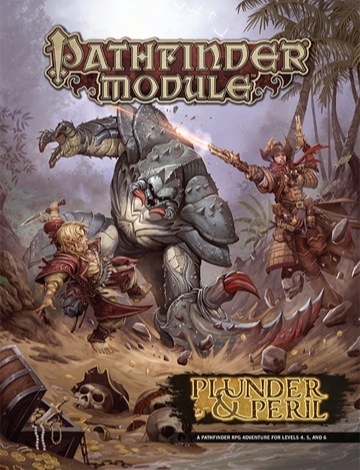 Plunder & Peril is a collection of three adventures that link to form one deluxe super-adventure for 4th-level characters, and includes 64 action-packed pages filled with aquatic predators, marauding dragons, cyclopean horrors, and more! These tales parallel and elaborate upon the swashbuckling excitement of the Skull & Shackles Adventure Path and the Pathfinder Adventure Card Game: Skull & Shackles Base Set. Plus, chart your course through pirate plagued seas with a full-color poster map featuring the most detailed view of the Shackles ever released. Players can expect to reach 7th level by the time they complete the third adventure and claim their share of Redclaw’s treasure—if they can survive the ancient terrors that guard the hoard! Written by Matthew Goodall, Alex Greenshields, Ben McFarland, Steven Helt. I am also going to reserve 3/25 as a spillover for part 1. This is a 3 part module, and each part grants a full level. Ryan has run each part in a normal slot, so we will see how things go. I can bump the possible overflow to 4/1 if no one objects then. 25th is also bad for me, driving back from Chicago that day. Although, there aren't any characters in that range that I particularly like, so I may sit out anyhow.